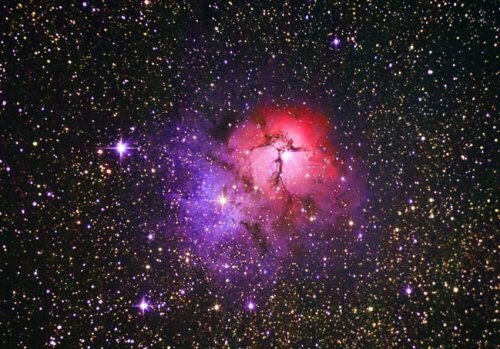 Trifid Nebula, also known as M20, is a bright nebulous region in Sagittarius. It has a rare combination of emission (red part) and reflection nebulae (blue part). In the emission section, stars are being born, while in reflection section, tiny dust particles reflect starlights from nearby stars. This image was taken by C. K. Lim on 27th March 2007.